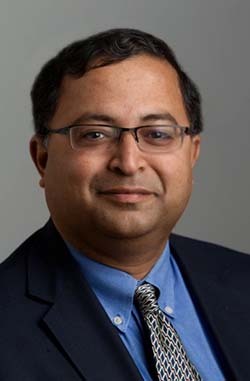 Prof. Venkat N. Krovi is the Michelin Endowed Chair of Vehicle Automation in the Departments of Automotive Engineering and Mechanical Engineering at Clemson University. He received his Ph.D. degree in Mechanical Engineering and Applied Mechanics from the University of Pennsylvania in 1998. The underlying theme of his research activities has been to take advantage of the “power of the many” (both robots and humans) to extend the reach of human users in the dull, dirty, and dangerous environments. These efforts at analyzing and realizing the potential of distributed-robotics and human-robot synergy has unlocked new opportunities in wide ranging applications in plant-automation, consumer electronics, automobile, defense and healthcare/surgical simulation arenas. The principal opportunities lie in building upon heterogeneous loosely-interconnected physical- and information-systems and architecting high-confidence and reconfigurable operational capabilities in the presence of uncertainties. The adopted research approach blends both design and control techniques to achieve system-level performance that far exceed the achievable capabilities of individual components. The adopted lifecycle treatment approach (design, modeling, analysis, control, implementation and verification) of novel robotic and mechatronic systems, places emphasis on both the theoretical formulation and experimental validation. His work has been funded by NSF, DARPA, ARO as well as numerous state and industrial grants and has received multiple awards, including the National Science Foundation (NSF) CAREER Award, Petro-Canada Young Innovator Award, several best poster, conference and journal paper awards. His work has been published in more than 200 journal/conference articles and book chapters, and patents. He has taken significant leadership roles in robotics research and education within multiple professional societies. Within the American Society of Mechanical Engineers (ASME), he has served as the General Conference Chair of 2014 ASME International Design Engineering Technical Conferences and the Chair of the Mechanisms and Robotics Committee (2014-2016). He now serves as a member of the Segment Leadership Team of the Design Materials and Manufacturing (DMM) Segment overseeing strategic planning for ASME’s technical products and services across 15 Divisions (~25,000 members). Within the Institute of Electrical and Electronics Engineers, he serves on the Conference Activities Board and Industrial Activities Board and organizer of the Distinguished Lecture Series of the IEEE Robotics and Automation Society. He is an active executive organizing committee member for many ASME and IEEE conferences. Most recently, he served as General Chair of the 2014 ASME International Design Engineering Technical Conferences (IDETC14) and as Finance Chair of IEEE International Conference on Robotics and Automation (CASE10, ICRA12, IROS14 and ICRA19). He serves as an Associate Editor of IEEE Transactions on Robotics, ASME Dynamic Systems magazine and ASME Journal of Mechanisms and Robotics. He has been an Associate Editor of ASME Journal of Dynamic Systems, Measurement and Control, IEEE/ASME Transactions on Mechatronics, and a member of the editorial board of Springer Journal of Intelligent Service Robotics.